Hi everybody! This is the nail art I made with H&M's Navy Cosmos as my base color. I was just playing around with my favorite nail art striper China Glaze Ink, looking for an easy freehand design. You all know I can't live without my precious tape when it comes to nail art, but let's face it, using tape can be quite time-consuming! So (easy) freehand designs are a nice alternative every now and then. :-) For this pattern that looks kind of '80s to me, I started drawing the zigzags on each nail. After I'd finished there was still something missing, so I used a dotting tool to fill in the empty spaces with big dots. I thought it turned out pretty cute in the end, but the best part was that the whole job was such a piece of cake. ^^ I used Essence Matt top coat for that ultimate matte finish, but below you can also see the glossy version that I just had to share with you. :) Hope you guys like it! I love, love, love this!! Such a fun mani! This is fun! Once more, great job Jane! 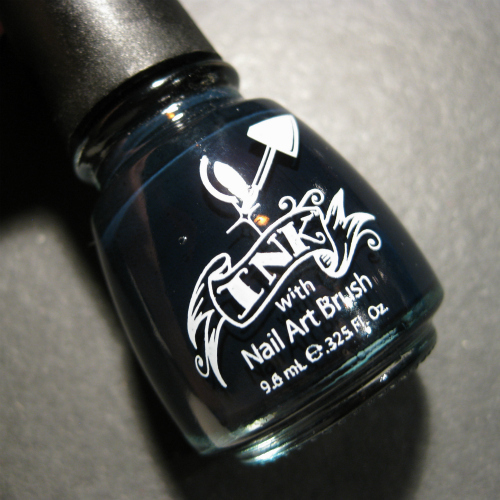 This is so cool, mattified it looks like Sharpie on your nails! this is sick!! I'm so gonna try this! Nossa lindo, mas gostei dele fosco, diferente! ACCCK I love this! I wanna do this RIGHT NOW!!! I am totally loving this! Super cute! Looks so cool! Simple and so awesome. Love it! Love this, the matte finish really sets it off!! I love this! I've never heard of that striping polish before. It's looks hot! And I love the matte polish underneath. Your manicures are always PERFECT! Even if I can't recreate them, I love just looking at them! I love it! Both versions! Ziet er super leuk uit! Zowel mat als glimmend eigenlijk, like! I was looking for an simple design and this is just perfect! This is so simple yet so pretty! I tagged you on my nail polish tag on my blog. This is so cool and I love the matte finish too. Very original but simple. i LOVE this nail art so much!!!! Part of whose name above to see Matt. Of what this company?